Posted June 6, 2011 by Ellee & filed under Uncategorized. 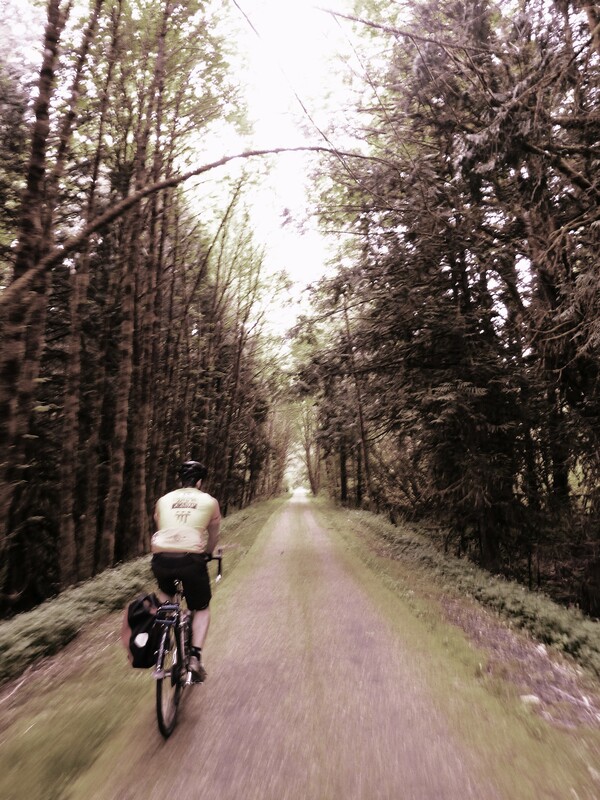 On the second day of research for a short Portland-based tour, I hit the Banks Vernonia Trail in Banks and had asked my friend Susan, who had been challenged to learn to ride a road bike, to come along. This trail seemed like the perfect spot for her to succeed in the saddle. So -after an itsy bit of prodding- she came out on Sunday….but not before sending me this inspirational video on learning how to ride a bike that made me gasp with laugher. She managed not only to ride all 21 miles, but ALSO to ride a patch of gravel, figure out turning, pedal over bumpy wooden bridges, and tackle different hand positions. Plus, she fell in love with her bike. Ahhhhhh. Another cyclist made. An angel dings a bell somewhere in heaven. 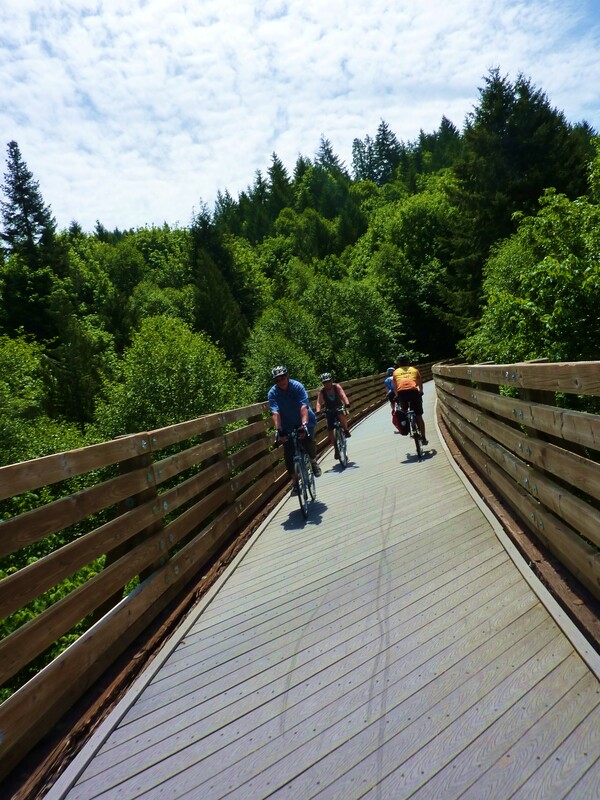 If bicycle companies ran TV commercials like car companies do, an advertisement would definitely be staged on the Banks Vernonia Trail. 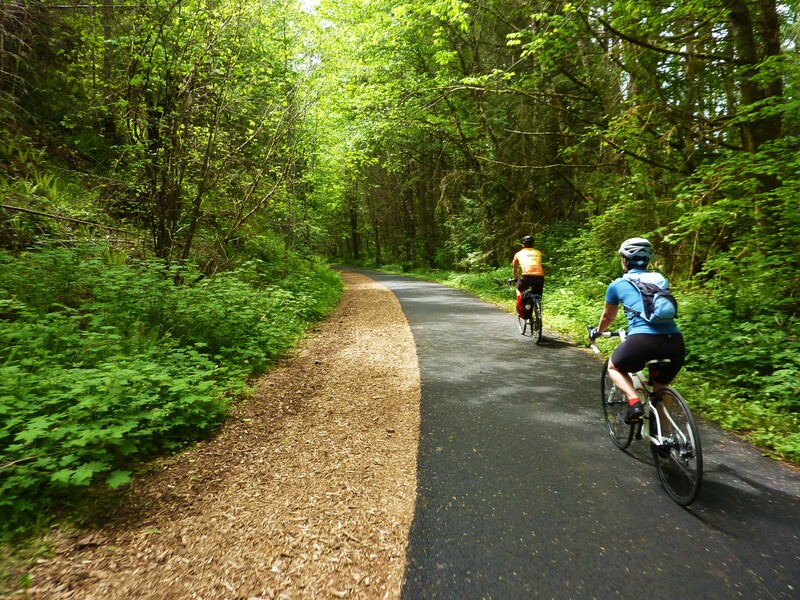 This very new 21-mile rails-to-trails path west of Portland is decked out with smooth pavement, manicured mulch, picnic nooks, and high-quality trail construction materials. As I’m naturally drawn to mountainous landscapes, it has taken my book research to finally motivate me to test the Banks Vernonia Trail. 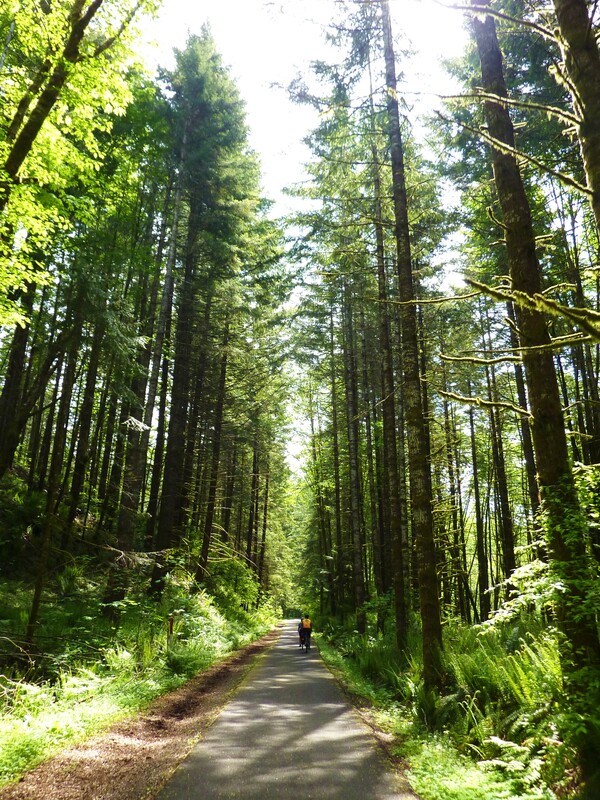 Riding slightly downhill for miles on a sun-dappled path surrounded by fresh forest smells and occasional peeks of the Coastal Range foot hills was better than any amusement park ride. It made me so goofy-happy I did yoga on my bike. I loved it. It’s really great for beginners and families or as a part of longer ride. One thing I really love about bicycling is constantly discovering that your limits are far beyond what you’d expected. One of the most satisfying things about helping other riders push their limits is hearing, “I didn’t know if I could do it; I did, and loved it.” (Insert statement about cycling being an analogy for life. )Way to go Ellee and Susan!